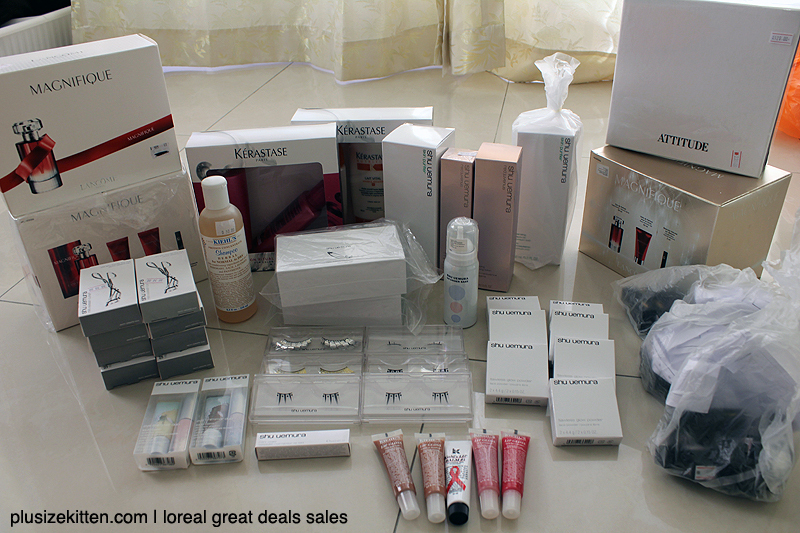 My haul don't look like I have spent RM2.6k, but that's what everyone was saying when they left the Loreal Great Deal Sale at Jaya 33 at Petaling Jaya (near Digital Mall and X-Jaya Shopping Center). I am still sorting out my stuffs, mostly it's not mine just helping friends & readers to buy stuffs as a personal shopper. I would say my best buy her would be the Shu Uemura Tokyo (2010) Neo-Fringe eyelash deal! it's retail at rm250, but I bought it at rm80 here. It's so gorgeous, you can use it for top & bottom of your eyelash and it has swarovski crystals on it. Great for wedding bride to be. Was done really well albeit the one-man long waiting Q. During lunch time there was lots of people but not that scary as Suria Meriang's sale. I am wondering why they did it on a Friday as they always do it on a Saturday. There were no massive barbarians shoving and pushing, I am glad. Also this time it's handle by Loreal not GME! thank goodness. I spotted make up artists/students grabbing eyeshadows, they were saying it's such a deal from Lancome's table and they had so many shades of it. I say it's a deal, you're still saving lots from retail price however be attentive to packaging, condition and year of the product being manufactured. Shu Uemura eyelashes for premium box went up rm30 compared to previously sold RM50 (and sometimes rm45). The nature inspired collection was available, but I already got that. The really awesome one is they were selling the tokyo lash collection in this sale, rm80 or not, I was actually grabbing each one - neo fringe, neo reflector and neo sparkle. However as I continue to shop for friends, I had to let them go as my credit space was not enough to get luxury items for myself, especially since I had to repair my macbook RM1.5k & upgrade from a point and shoot to a entry level dslr camera that cost RM3.1k now. You won't be seeing me go crazy that much until I pay all this off. Shu Uemura cleansing oil came in 450ml (only green) and 150ml (for blue and green). They were all sold out by noon. Shu uemura brushes were *jaw drop* no as cheap as they use to be, which is good because I don't believe in selling good quality brushes for rm20 or more! while some things went a bit wee up in price, others went down at a deal compared to previous sales. A win-lose scenario. I stayed from 9am-4pm in the sales, occasionally going out for a breather or a drink. I never stayed that long in a sale before and I didn't really take down price and product list as I can't seem to find the point of that anymore. What I was waiting for was the closing down deal, yes there is such a thing. I have never witness it until that day. Biotherm skincare went buy 1 free 1 after 3pm, and fragrance section were having a deal on Armani Women and Magnifique perfumes. Buy 2 for the price of RM200 Magnifique perfume sets was *jaw dropping*. I got 4 boxes (helping friends to buy). I heard after I left, there was even more price slash nearing the closing time. Darn.. if I stayed, I would have achieve a one whole day at sale's record. Seriously would like to see pouches, bags, notepads, memorabilia's, etc gwp items/gifts being sold, I would go crazy buying it like Anna Sui warehouse sales. People probably start killing each other on the table if there's such items being sold. Well Asia Jaya Lrt is nearby and you just take a rm5 cab to Jaya33 (dependin on jam). Car Park outside of Jaya 33 is crazy as usual, it's very hard to find a spot and don't double park or illegal parking might get summons. I am not sure about parking in Jaya 33 since I didn't drive here. This sale is not as happening as the ones done in hotel (more variety more products) and over the years, the price has been increasing and warehouse sales is not was it use to be like anymore. Still cheaper than shopping centers, plus a lot of inconveniences (time, effort, crowd, waiting line) also temptation lurking everywhere at sale place makes you buy more than save! so haha.. beware ladies. I was there about 11 something, but left soon after cos there was nothing that I wanted. And I made two rounds in all the rooms. Oh well. wow - u got d shu egerie eyeshadow set from summer this year - though usage inconvenient bit but great result!!! I'm glad I managed to drop buy as well!! But yeah.. was wondering why they made it on friday.. it's working day. great haul miu. let me know if no one claim their items...huhuhuaaa..(i guess is impossible). hi mui, I've been wondering how to be a VIP guest and get invited to the pre-review sales before 10am, where they open to the public? Besides does VIP really able to grab good staffs ahead of the public?